When a former magazine editor wanted to redo her family's 1906 Victorian in San Francisco, she turned to designer Regan Baker, a friend she met in yoga class more than seven years ago. Baker's namesake firm was tasked with giving the address a Parisian atelier style in an ode to the homeowner's French-Canadian heritage. 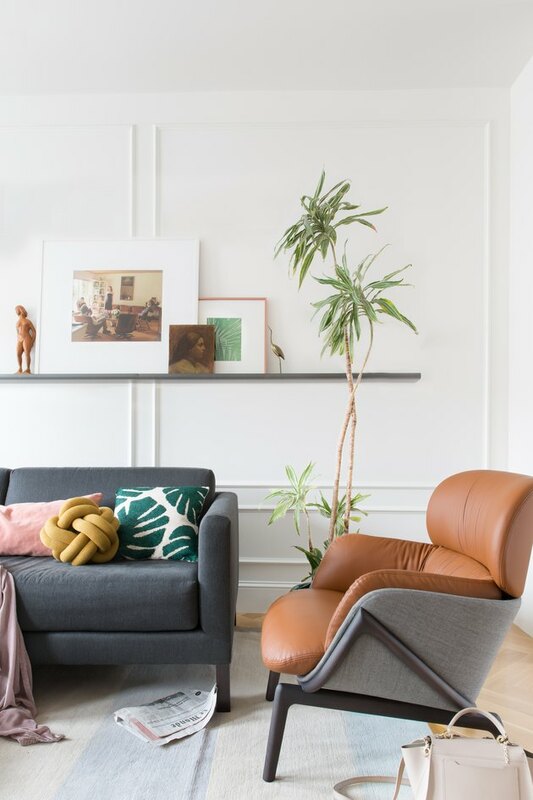 The design had to be minimalistic — but with a little mix of edgy and bohemian touches thrown in — all while staying within the property's original footprint. But that was just the beginning. In addition to those primary objectives, the homeowner also wanted storage that tucked everything out of sight. 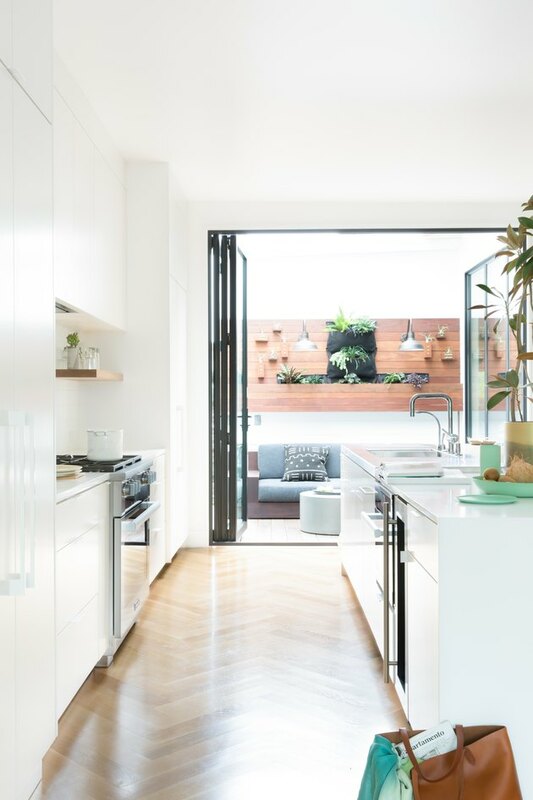 In the kitchen, the firm crafted a space for daily appliances, like the toaster and coffee maker, so they could be pulled out and pushed back without unplugging. And in the dining room, extra coat and shoe storage mirrors the custom hutch on the opposite wall. Now that the editor's house has received a colorful and airy rewrite, she and her family are ready to start a new chapter. 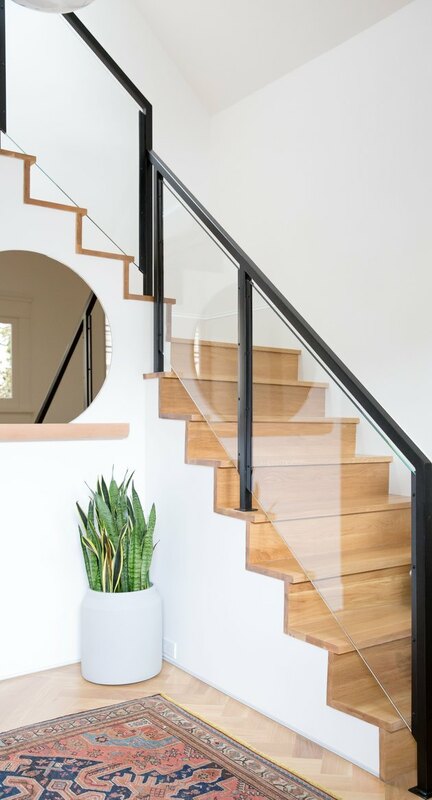 A staircase and Alice Tacheny mirror shelf welcome visitors at the front door. A Pak Oriental Rug rests underfoot. It was important that any artwork in the home was edgy and playful, but still sophisticated. In the living room, photographs by Jessica Todd Harper hang over a sofa filled with Urban Outfitters throw pillows. A subtle rug by The Rug Company adds more texture to the space. From the kitchen, a living plant wall by Fine Root SF invites the family out to the back patio. 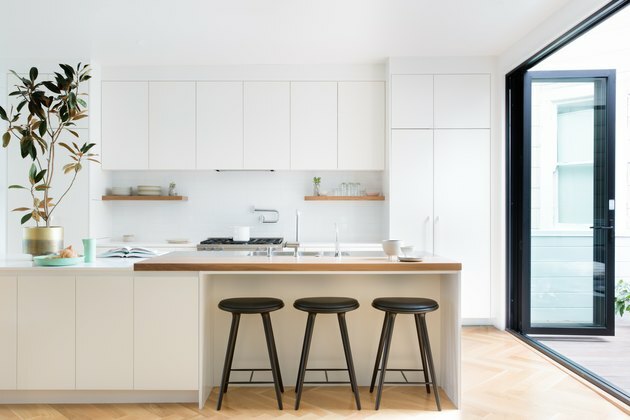 The key to this minimalistic kitchen? Storage. Every item has a place. In this kitchen, Mater bar stools contrast against white cabinetry and Atlas hardware. The couple and their two daughters gather around this custom dining table by Knife & Saw with chairs by Kai Kristiansen for Schou-Andersen Møbelfabrik. Lindsey Adelman's Branching Bubble chandelier hangs overhead. 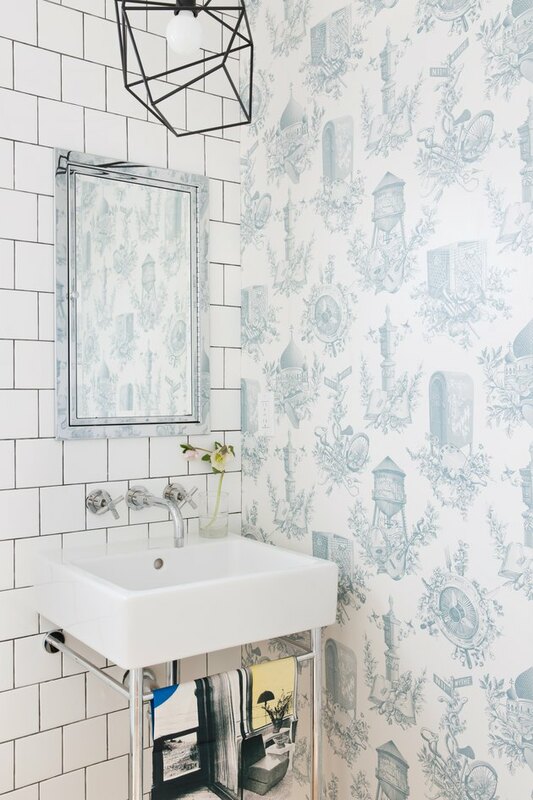 In the powder room, toile wallpaper by Flavor Paper meets white subway tile. 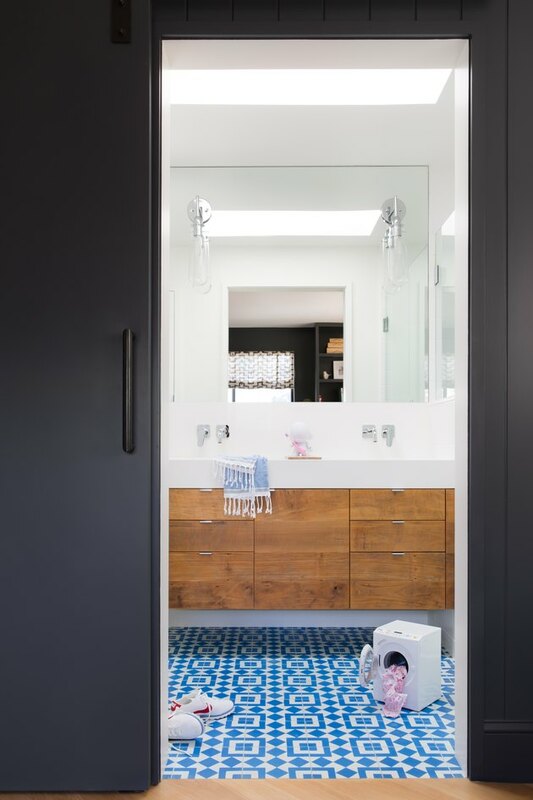 A pendant light by Iacoli Mcallister hangs over a Duravit sink and Restoration Hardware medicine cabinet. The kids' study doubles as a guest room. A custom pull-out bed by Ukiah Cabinetry rests by a desk with a Herman Miller desk chair. 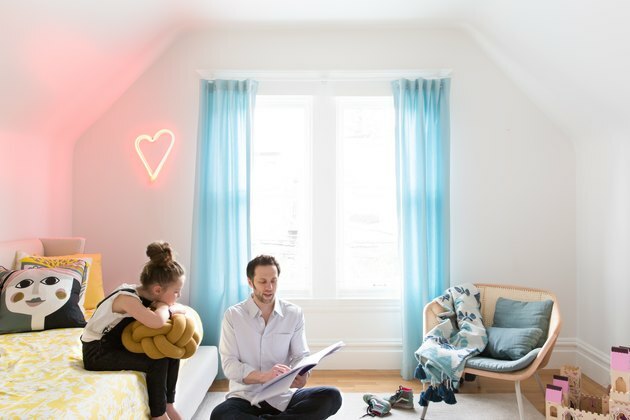 Schoolhouse Electric sconces add light, and Imm Living balloon dog bookends add charm. Colorful geometric tile adds whimsy to the kids' bathroom. A JR Woodworks reclaimed teak vanity is topped with a custom Caesarstone trough. A major part of the renovation was moving the master suite to the basement, and not letting it feel that way. The space capitalizes on natural light through its new Bonelli glass doors to the backyard. 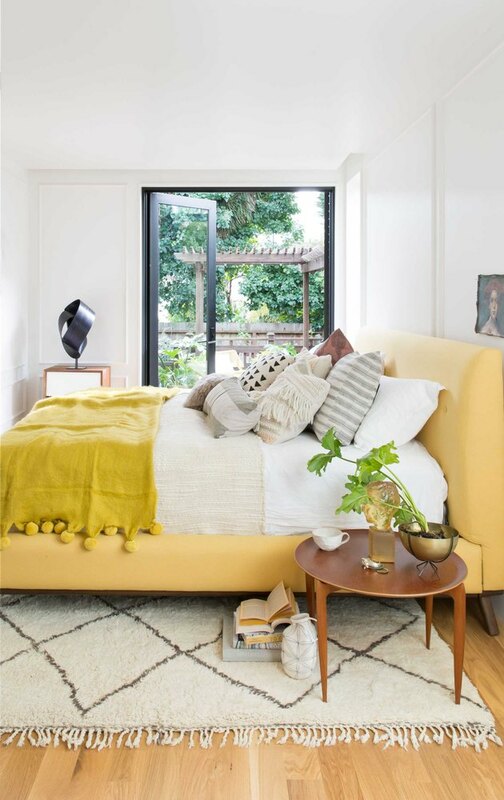 Human Condition pillows and an Anthropologie throw top the yellow bedframe. An Urban Outfitters LED heart light and Skrivo Designs side chair add texture to this kids' bedroom. Embracing outdoor living is one of the highlights of living in Noe Valley. 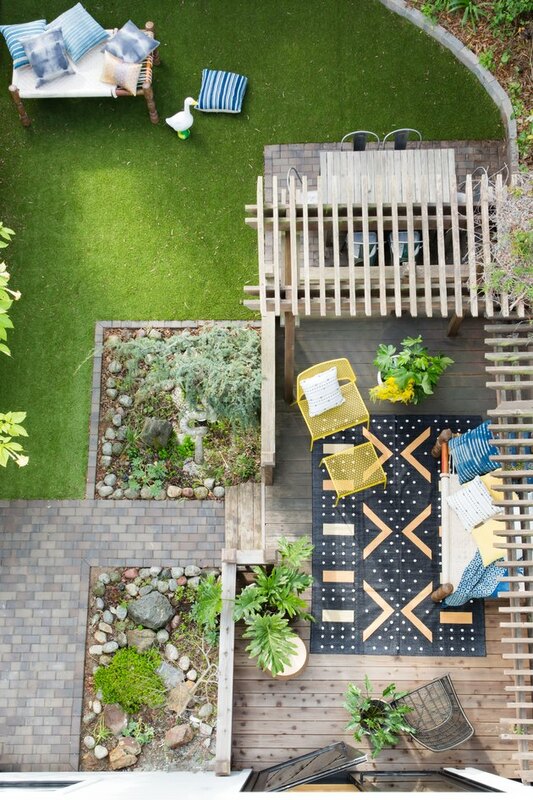 In the backyard, Big Daddy's patio benches and pillows sit across a Thread Lounge rug. A yellow chair by Fermob sits nearby.